Music! We love music and for Poppins Book Nook this month we are taking a look at composers. This collection is part of our best books for boys series. 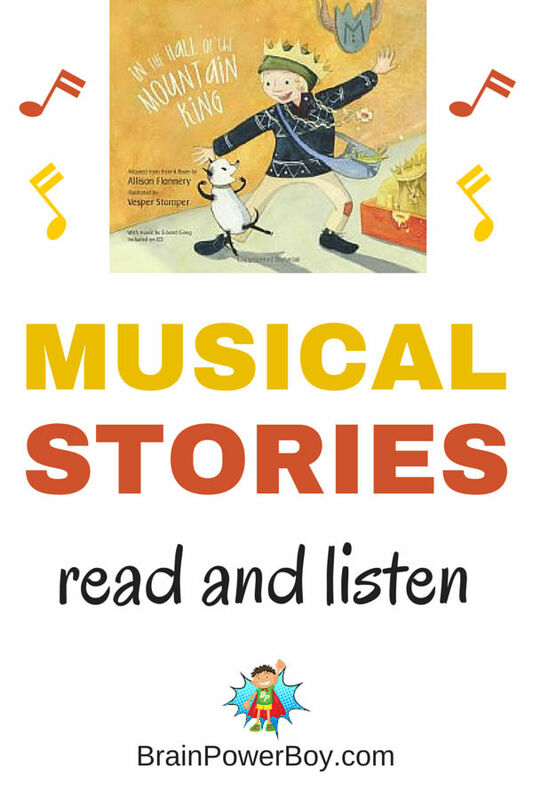 We pulled together resources to help children appreciate music through some wonderful musical stories. My husband is a musician who plays many instruments, and he is a singer-songwriter as well, so music is a part of our lives. We really enjoy listening to different types of music and each of us has our favorites. Even if you don’t have a musician in the family, introducing different music styles, and the composers who wrote them, to kids is not as hard as one may think. Try a few of these selections and open up their world to a variety of new music that they may really enjoy. If you have a boy with a musical learning style he will love these books. If you have a child who doesn’t really care for music at all ask him to humor you and put a few different selections into the CD player. You never know, one of these just might strike his fancy. We are a huge book loving family but when it comes to music just reading about it doesn’t quite work for us. So we picked books that came with CDs. These are awesome! Read, listen, learn. Our first selection is from one of our favorite poets Jack Prelutsky (see more of his titles in Funny Poetry Books for Boys) Camille Saint-Saëns is the composer of The Carnival of Animals which he wrote in 1886. It is brought alive in this picture book by the illustrator of Harry Potter and with Mr. Prelutsky’s narration. Have a listen to The Carnival of the Animals . There is no better story and composition combination to get them interested in listening to these types of works than that of Peter and the Wolf. Composed by Prokofiev in the 1930’s it has been a beloved piece of music ever since. I have listened to this so many times in various renditions. Try this one which includes a book: Sergei Prokofiev’s Peter and the Wolf . Cole composed Tubby the Tuba in 1946 and the picture book has an old-fashioned charm and the story is a good one about being ones-self. Next comes a story from a Norwegian composer named Edvard Grieg. It is about a curious boy who goes exploring. In the Hall of the Mountain King is worth seeking out. After listening to some wonderful music and learning a bit about their composers, an exciting thing to do is to encourage your kids to create their own music. If you have musical instruments, be sure to break them out and leave them in places your kids can easily access. Another option is to try making some music on the computer. 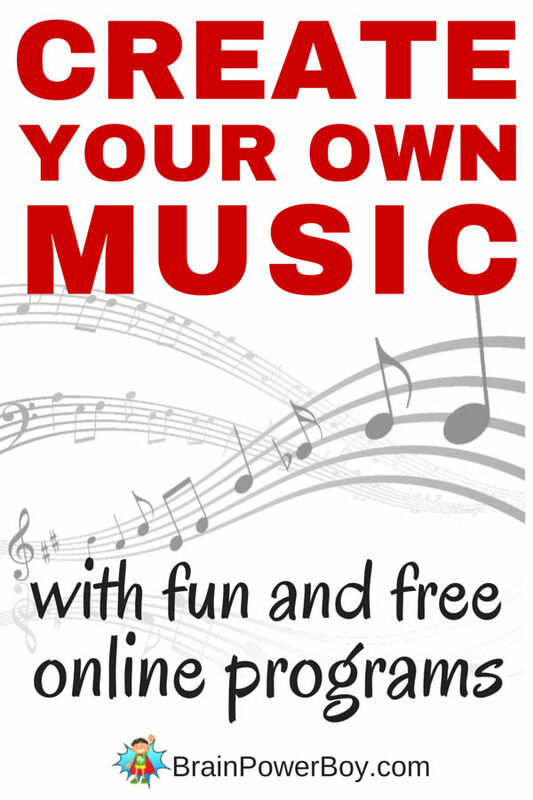 Today I rounded up some ways for your kids to make music online. These are a lot of fun to play around with and I think kids will really enjoy them – you might get caught up in a couple of them yourself. I know I did with Seaquence. In our Homeschool Unit Study:May the 4th Be With You, you will find a very neat site that allows you to put together your own Star Wars Soundtrack. Perfect for younger kids, this free online Write Your Own Music game lets them press the number keys to compose a song which they can then play back. Not all composers are from the olden days. Let kids try their hand at mixing up a bit of music with this modern music game. You can save your songs and create a playlist. This one is a bit primitive, however it is nice that it adds the length of notes to the mix. Notes you select are short, medium, long, and longest. It would be nice to have notation included but it may be interesting for kids to use. This selection is for older kids. They can play around with pianos, drums and guitars as well as these really neat musical cubes. Go to ButtonBass to make some music. This is the most unusual music game I found for you by far! You have to see it. I love it because it is totally unique and fun to play around with. You do need Flash enabled in order to use it. When you go to the Seaquence website click on “learn more” if you want instructions. I actually suggest just clicking “go” and seeing what your child does with it. You can also see what others have created by clicking on “recent” in the upper right hand corner of the site. I hope you enjoyed this post related to composers. Read books, listen to what they have created and compose some of your own music too. It is all very rewarding. Those websites look fantastic…I can’t wait to try a couple of them with my kids! I think they’ll love them! Thanks Carla, I hope you all enjoy them! I love Peter and the Wolf stories! Thank you for sharing all of these. Me too Leah! You are most welcome. What great website finds! Featured you on Mom’s Library! Thanks so much for visiting. I’m glad you like the choices. We love music in our home. It is hard to get the boys to do much other than appreciate it though. Thanks for sharing the ideas! Perhaps some of these programs will appeal to them. You are most welcome for the ideas – I hope they like them. Oh we have the Peter and the Wolf book – I’ve been reading it to the kids, and I need to do some extension activities too so thanks for the reminder! Clare – you have to try the CD. It is so wonderful! Musical books are so much fun. I can’t wait to check out some of those websites you shared for making our own music. My youngest loves making music, so he’s going to really enjoy those. Do check them out – especially Seaquence – your boys will really find it interesting. I’ve always loved Peter and the Wolf! I love the idea of encouraging a love and knowledge of music in youngsters, and now I have lots of resources for my own boys! Thank you so much for sharing these at Merry Monday! I remember being amazed at Peter and the Wolf when I was young and my son loves it even more. I hope your family enjoys the resources. Thank you so much for taking the time to comment. I had some fun trying out some of the websites you mentioned. Seaquence was indeed very different, I wonder who comes up with this stuff lol. I’ll have to show it to my daughter and see what she does with it. Thanks for linking this up at the Learning Kid Link-Up. I’ll be pinning and tweeting. Thanks for the comment. Yes, different is a good word for that one. I found it oddly fascinating 🙂 I really appreciate the pin and tweet!